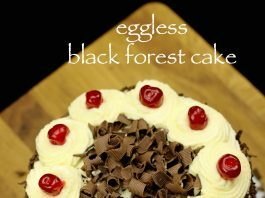 black forest cake recipe | easy eggless black forest cake recipe with detailed photo and video recipe. basically a layered chocolate sponge cake sandwiched with cherries and whipped cream. traditionally, a german dessert baking delicacy known as schwarzwälder kirschtorte which is termed as black forest gâteau or more popularly as black forest cake. 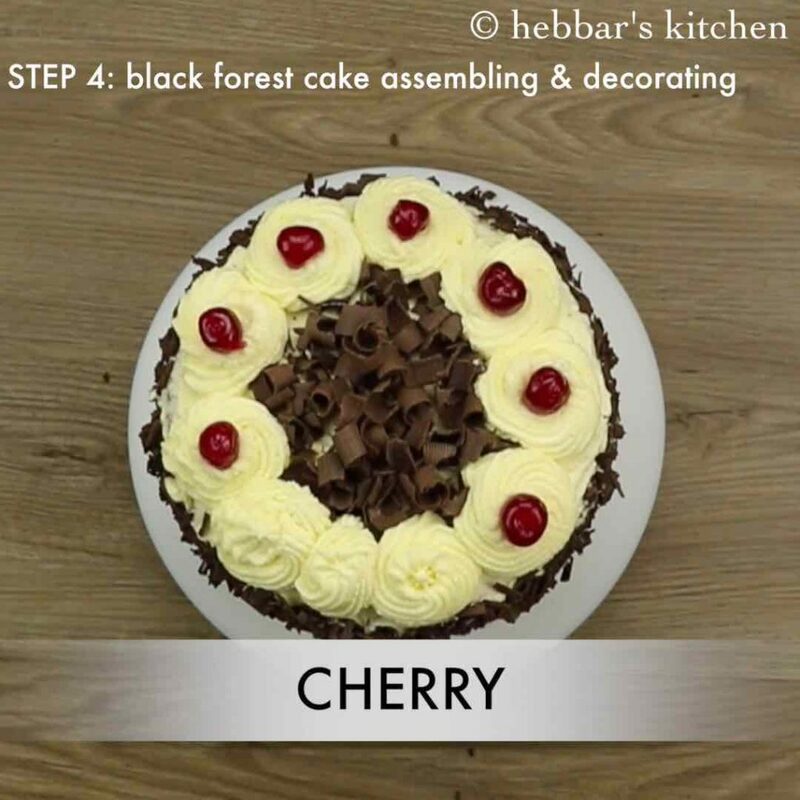 black forest cake recipe | easy eggless black forest cake recipe with step by step photo and video recipe. perhaps one the most popular cake recipe and often termed as the king of all cake recipes. 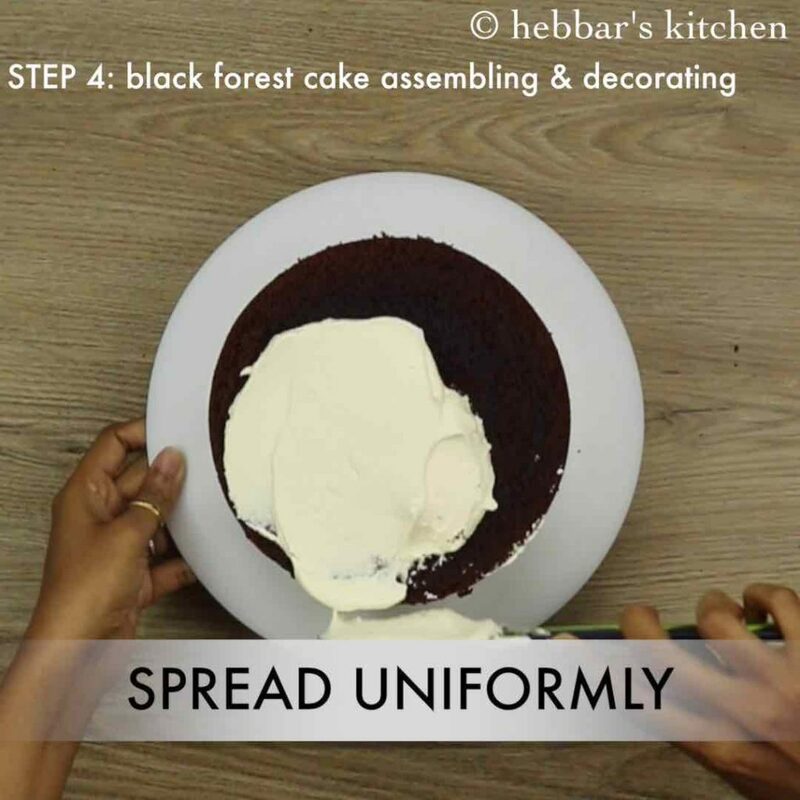 there are several variations and flavours to black forest cake recipe but it is usually prepared by sandwiching the chocolate sponge cake. i have always been a big fan of eggless cake recipes and the chocolaty flavoured black forest cake is my latest addiction. 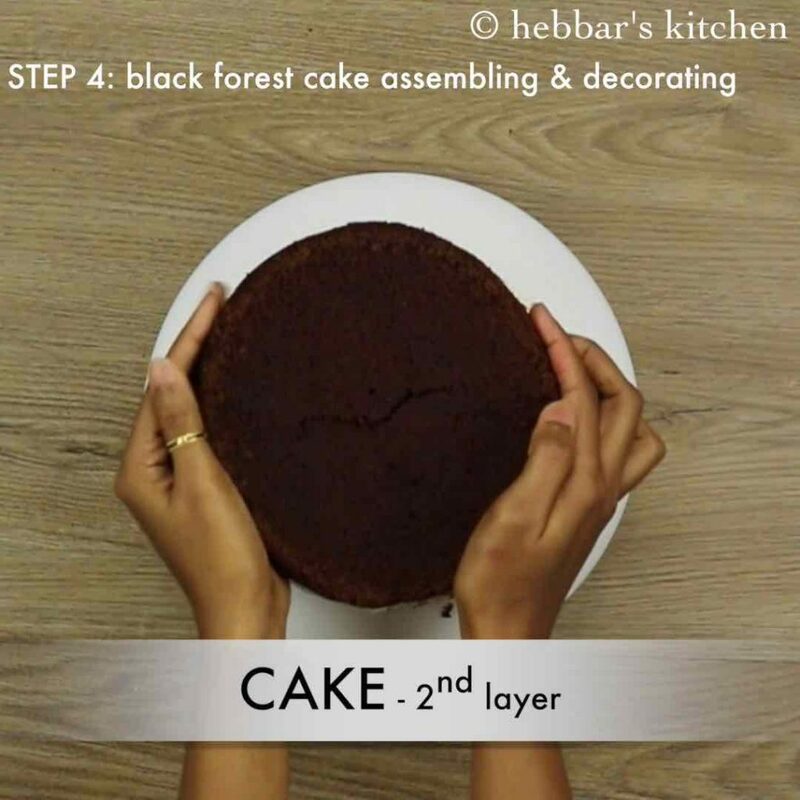 i use to prepare normal chocolate cake for any occasion, but since i learned this simple and easy black forest cake recipe, there was no looking back. unlike other cake recipes, the main thing i like is the moistness within each layer of cake due the cherry syrup applied to each sponge cake. moreover the cherries added at each layer with whipped cream takes this cake recipe to next level. 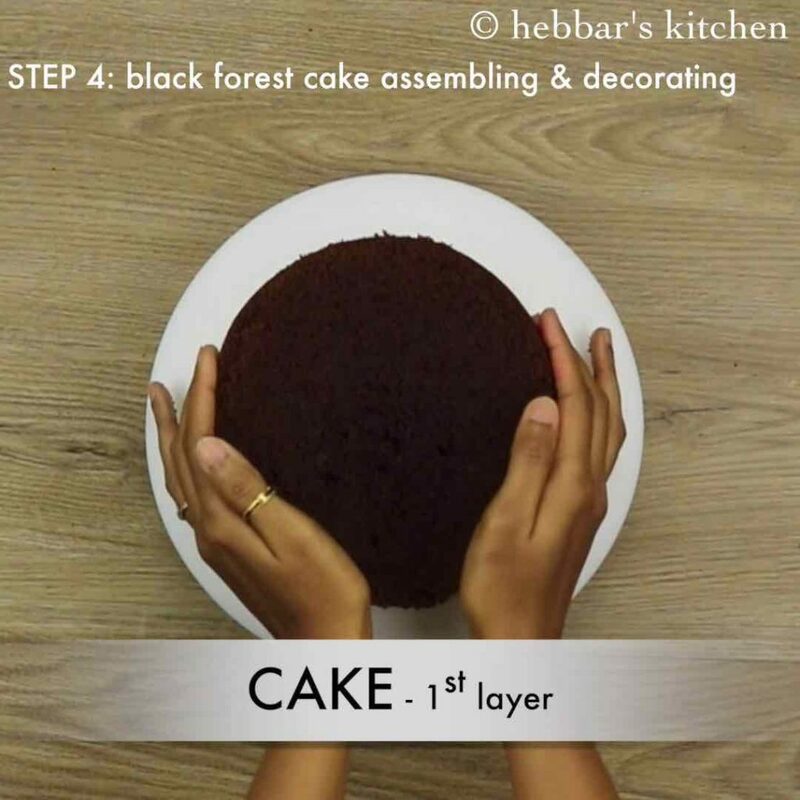 furthermore, some important tips and suggestions for perfect and moist black forest cake recipe. firstly, in this recipe i have prepared 4 layered sponge cake by sandwiching the whipped cream and cherries. 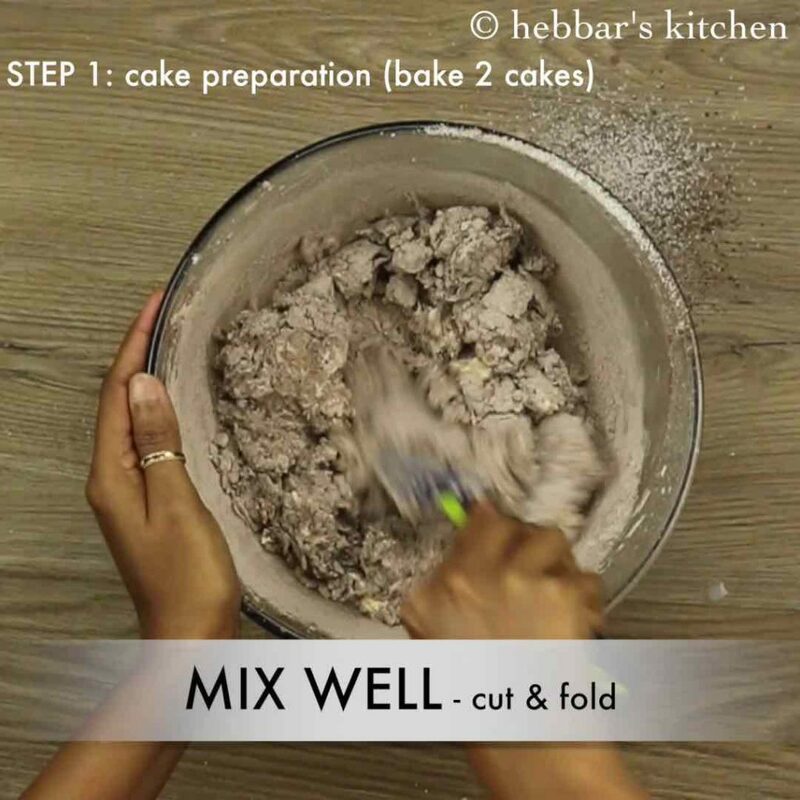 this can be reduced, 2 by preparing only cake and cutting them to 2 halves. 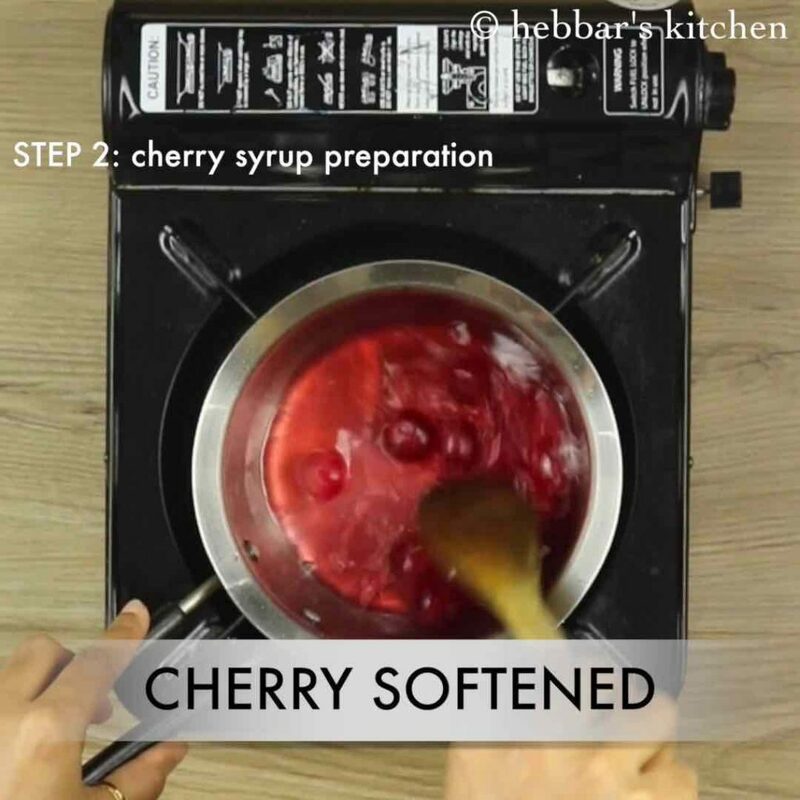 secondly, do not apply too much cherry water, or otherwise cake may turn soggy. in addition, the chocolate cake can be prepared and stored in freezer until it is required. lastly, make sure the sponge cakes are brought to room temperature before icing them with whipped cream. otherwise, the cream would melt and would not stick to the cake. firstly, in a take powdered sugar and butter. 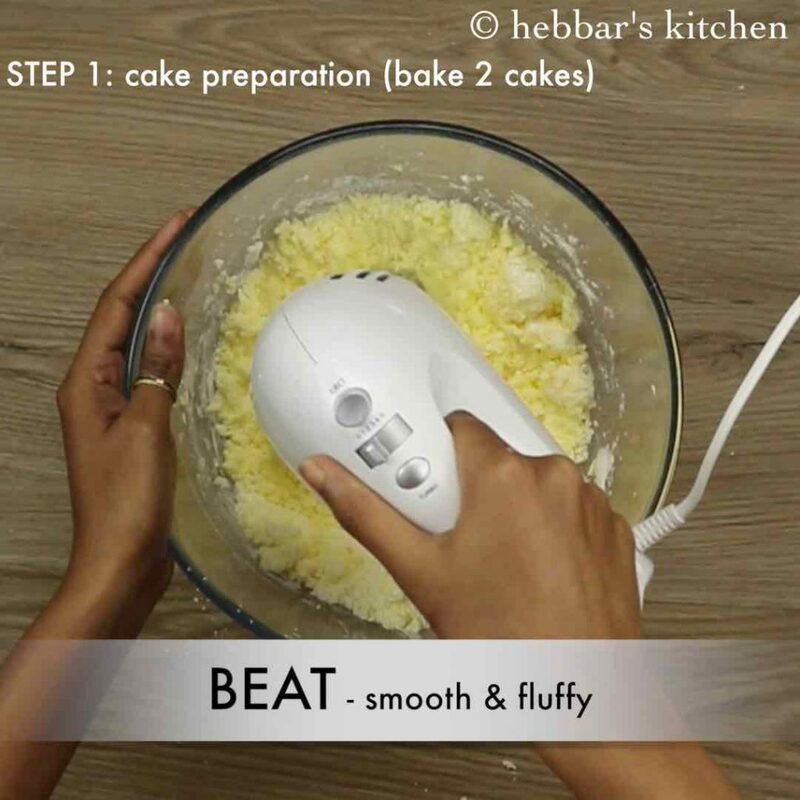 beat till the mixture turns smooth and fluffy. further add vanilla extract and buttermilk. combine well. now sieve maida, cocoa powder, baking powder, baking soda and pinch of salt. then cut and fold gently till the smooth dropping consistency batter formed. 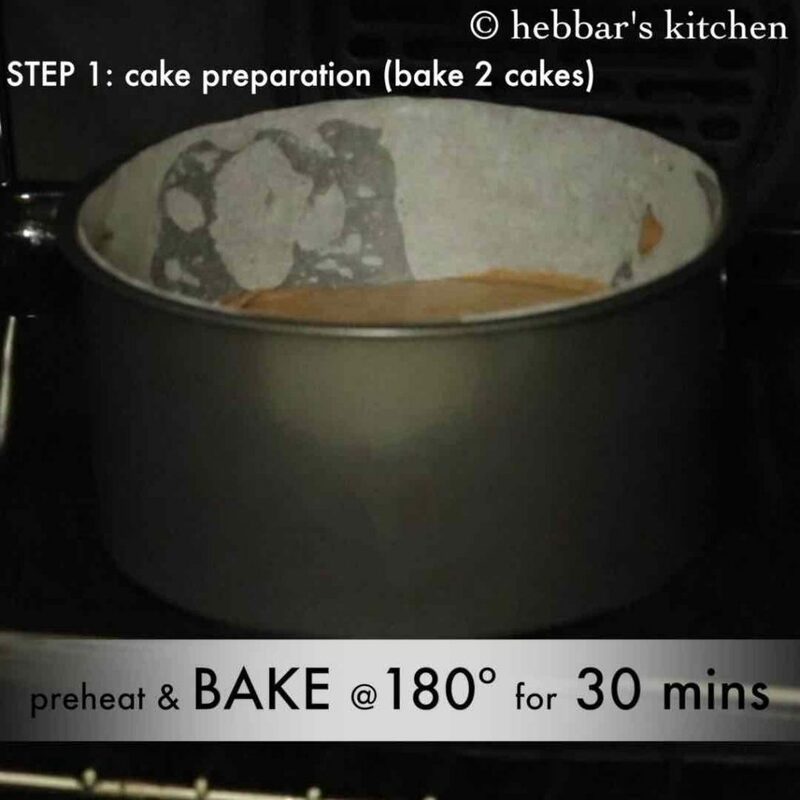 bake the cake at 180 degree celsius for 30 minutes. 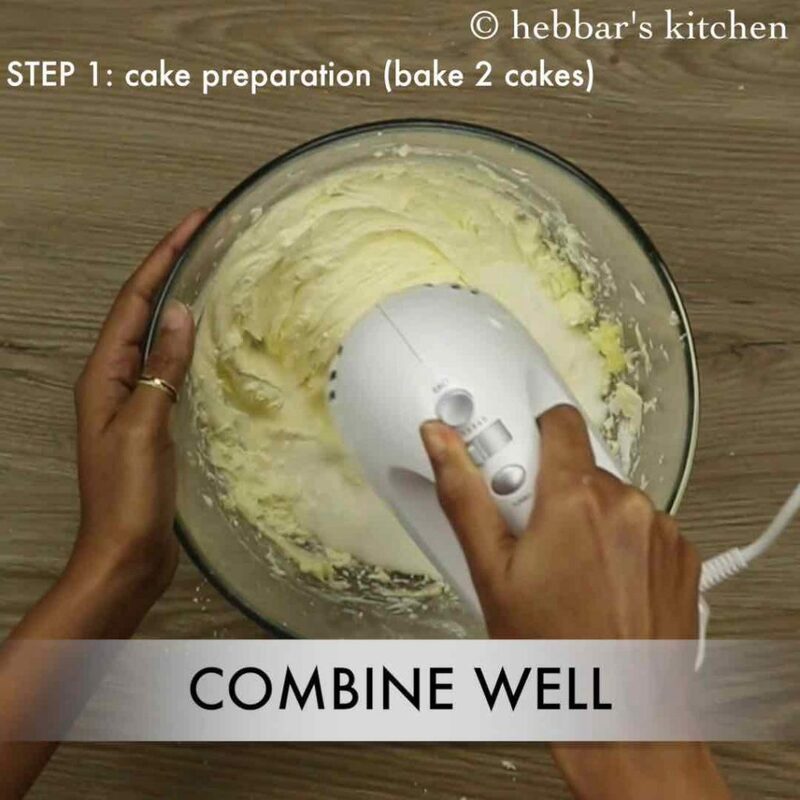 finally, cool down the cake completely and cut into 2 equal half. now place 1st layer and top with cherry syrup, frosting and cherries. repeat for 2, 3 and 4th layer. 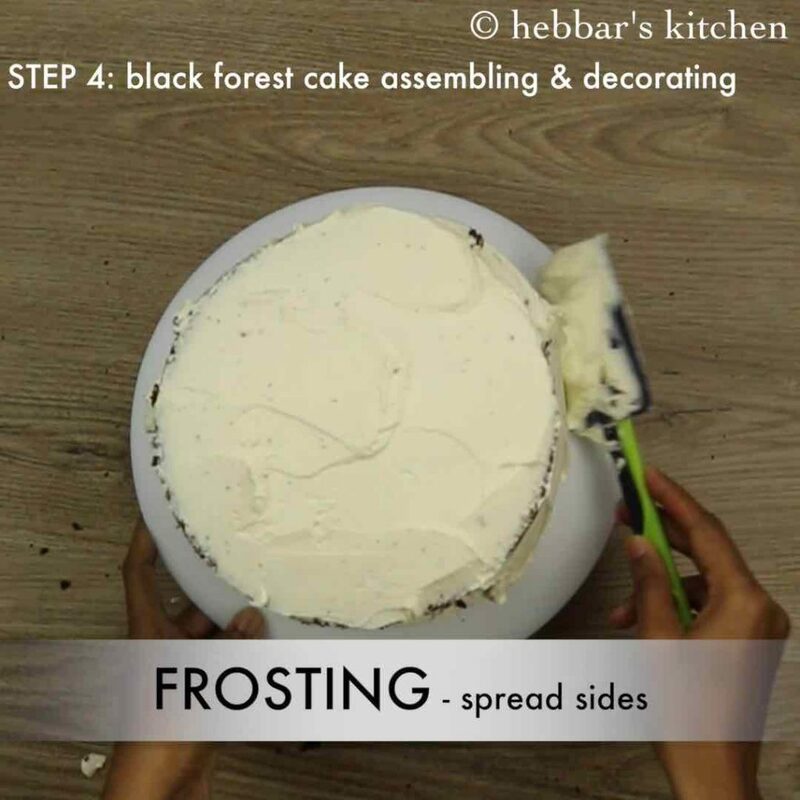 start spreading frosting over the sides of cake carefully. place chocolate curls in the centre and stick on sides. furthermore, decorate cake and place cherries in the centre. 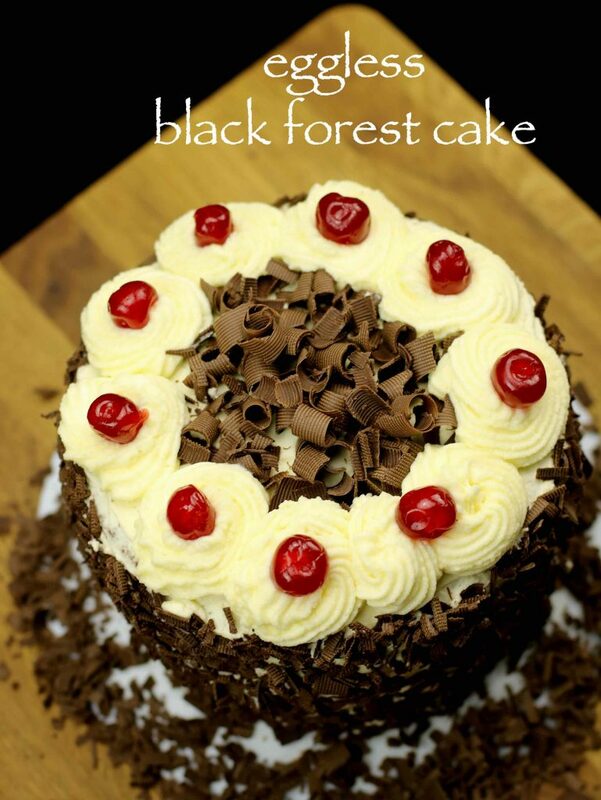 finally, black forest cake is ready to cut and serve. 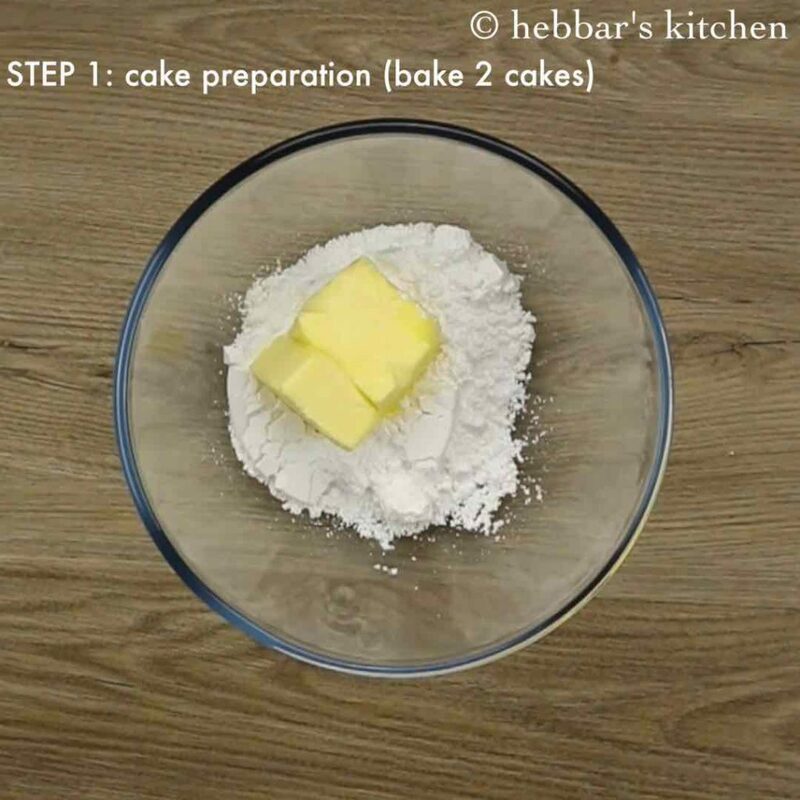 firstly, in a large mixing bowl take 1 cup powdered sugar and ¾ cup unsalted butter. you can also use salted butter, make sure to skip salt later. 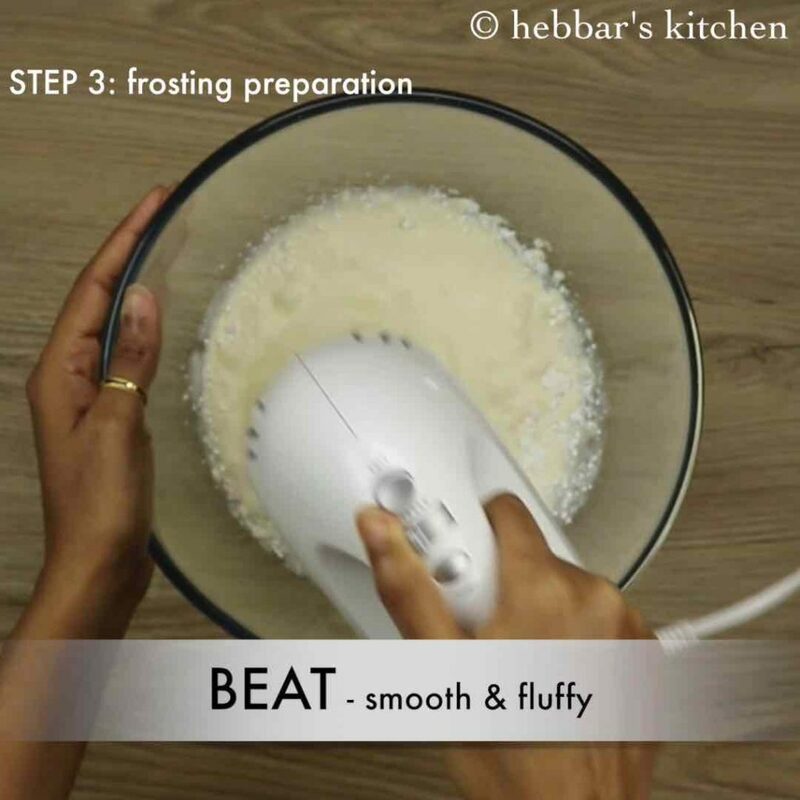 with the hand blender or whisk beat in one direction till the mixture turns smooth and fluffy. and also the mixture turns from yellow to whitish. give a pulse and combine well. now sieve, 1½ cups maida, ¼ cup cocoa powder, 1 tsp baking powder, ½ tsp baking soda and pinch of salt. then cut and fold gently without disturbing the air bubbles. also add more buttermilk as required. 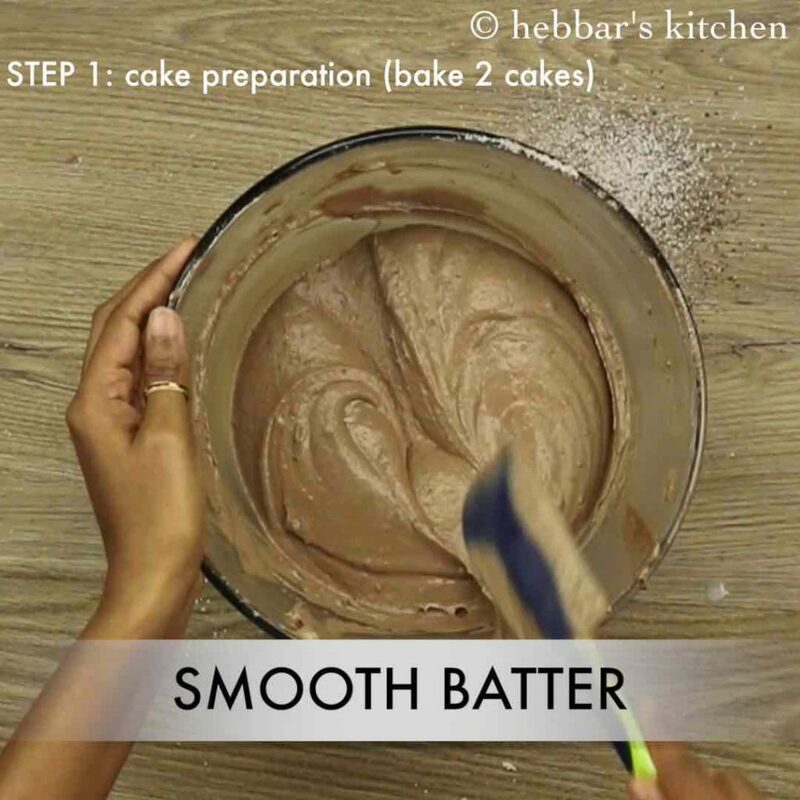 make sure the batter is of smooth dropping consistency. meanwhile, preheat the oven to 180°c for 10 minutes and transfer the cake batter to a cake mould (dia: 7 inch, height: 4 inch). make sure to line a butter paper at the bottom and sides of tray to prevent from sticking. and also tap twice to level up uniformly and remove any air bubbles if present. 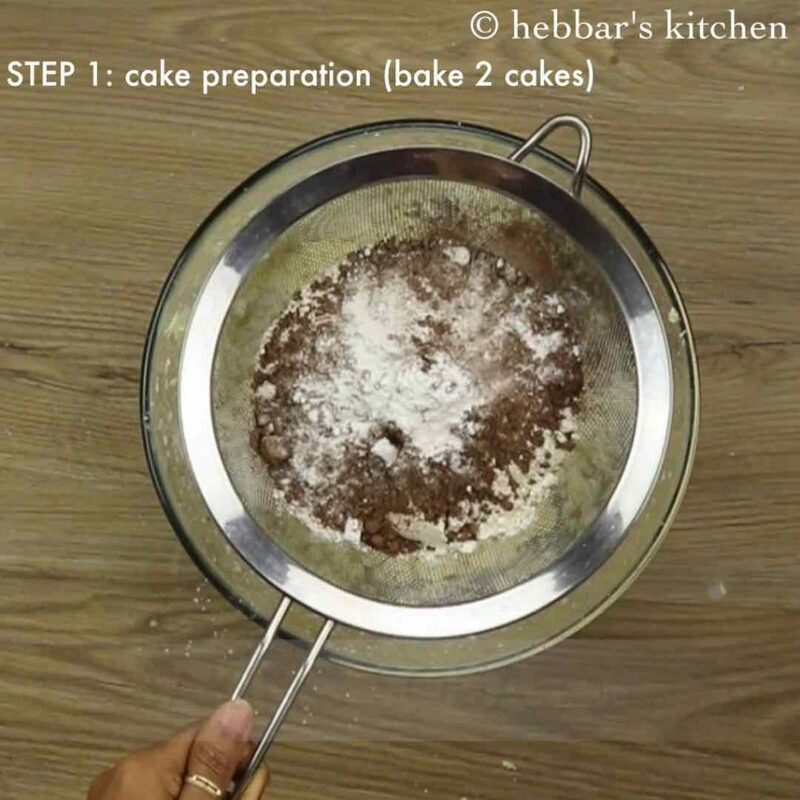 bake the cake at 180 degree celsius or 356 degree fahrenheit for 30 to 35 minutes. to bake in microwave or cooker check out the notes section below. 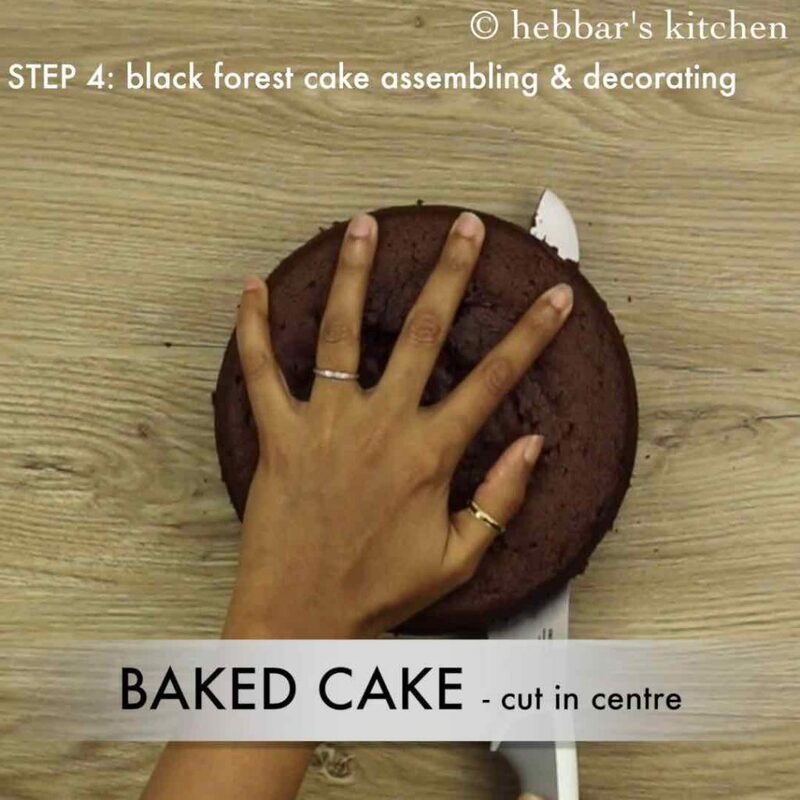 to check the cake has baked completely, always insert a toothpick at the centre and see if it comes out clean. else bake for 5 more minutes. 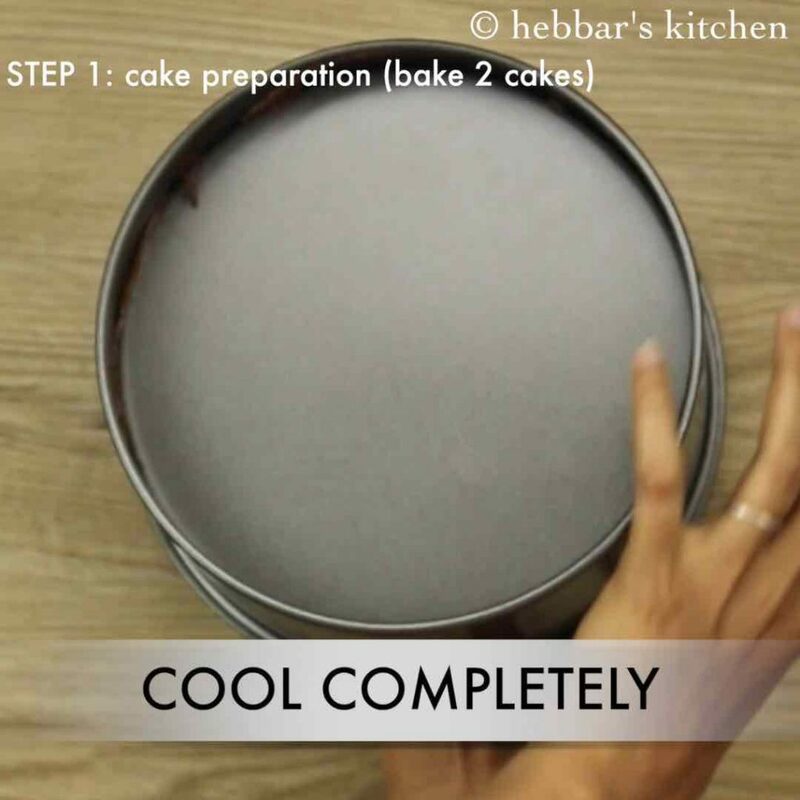 finally, cool down the cake completely. 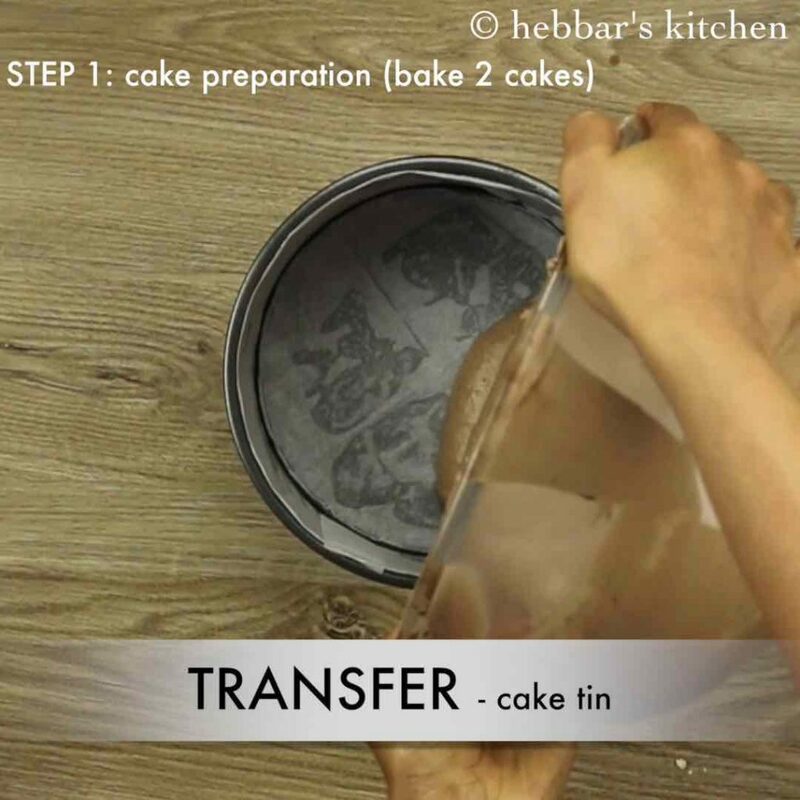 also transfer the cake to cooling rack to cool faster. 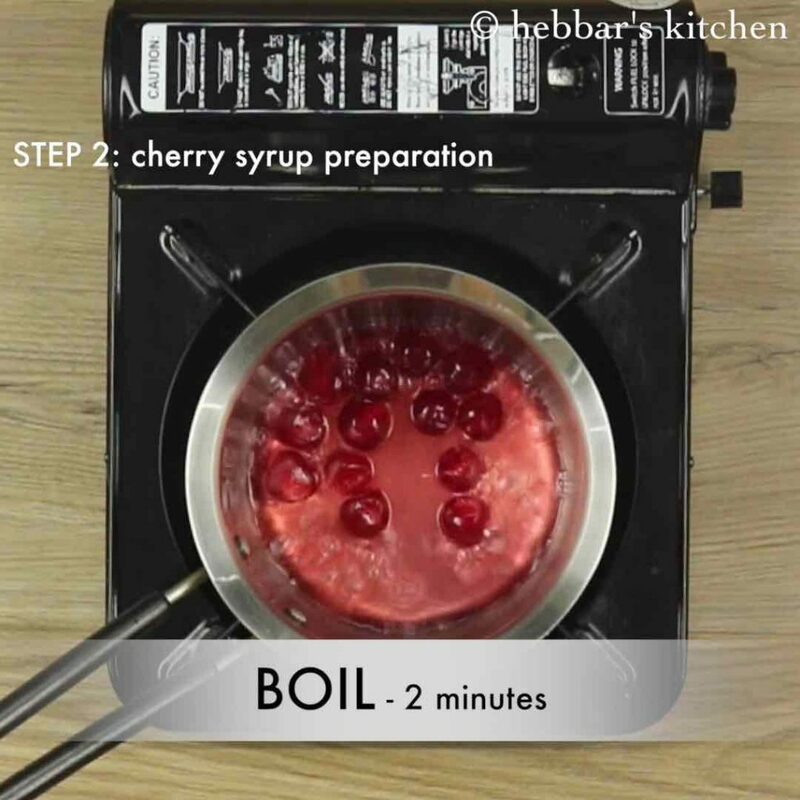 firstly, in a small sauce pan take ¼ cup cherry, ½ cup water and 1 tbsp sugar. 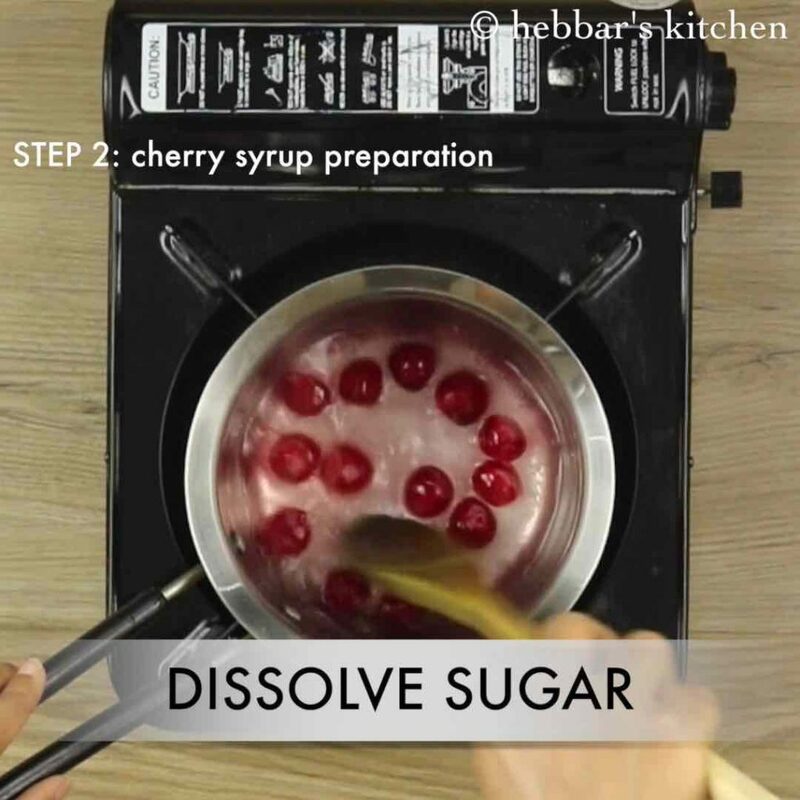 turn on the stove and dissolve sugar. further, get the mixture to boil for 2 minutes. also check the cherries are softened. 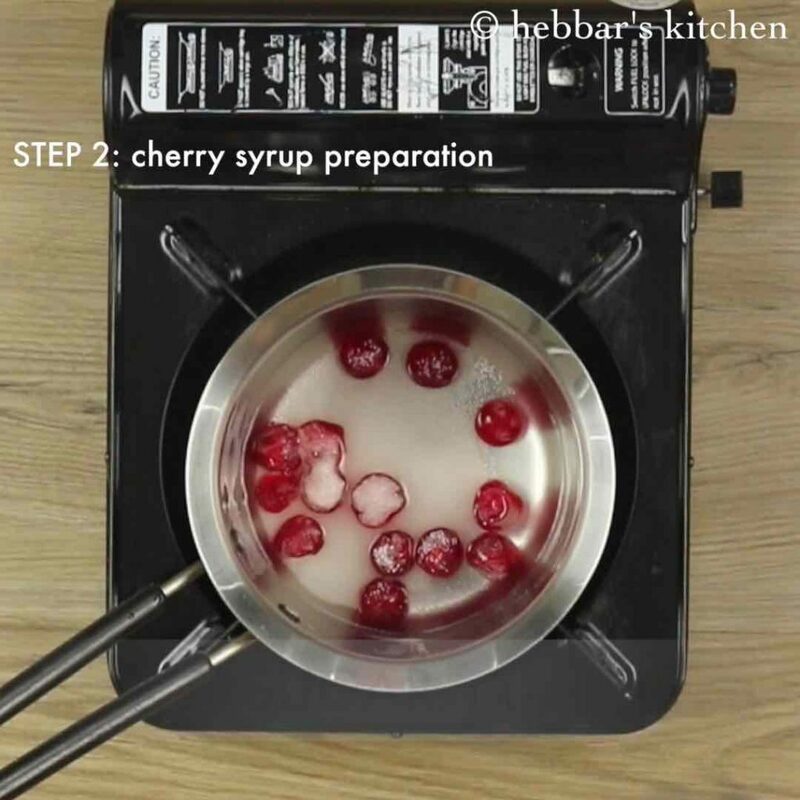 finally, transfer to the bowl, cut the cherry into pieces and allow to cool completely. 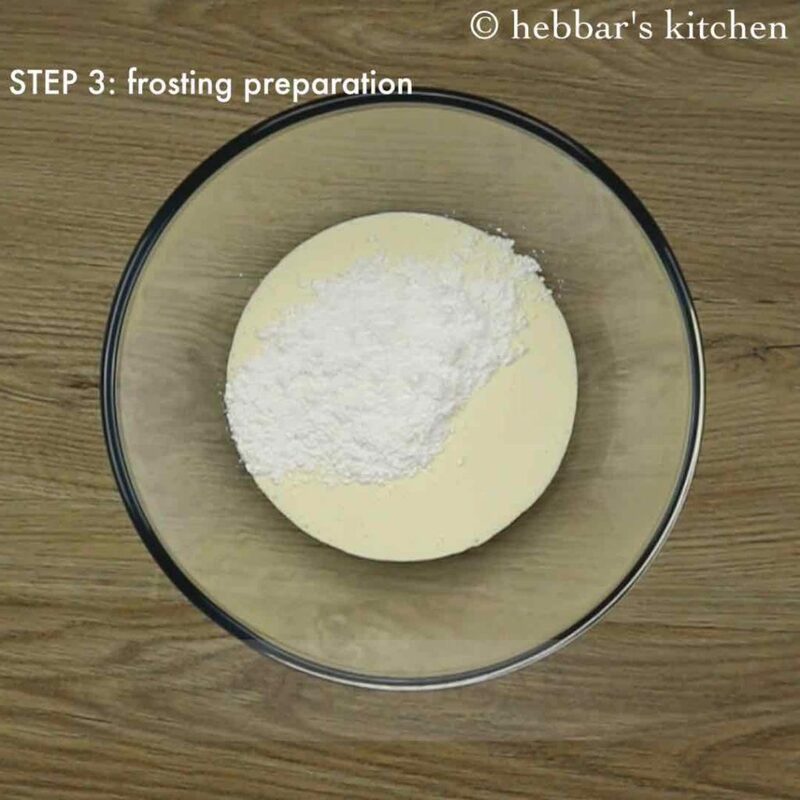 firstly, in a large bowl take 2 cups of heavy whipping cream or thickened cream and ¼ cup powdered sugar. 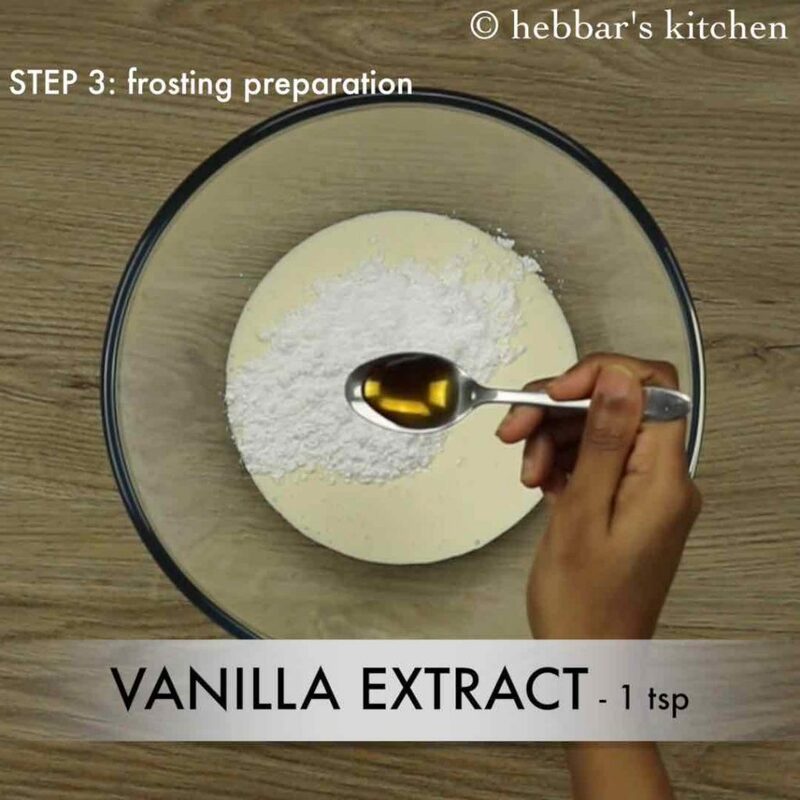 also add 1 tsp vanilla extract and beat or whisk. beat till the cream turn thick, smooth and fluffy. 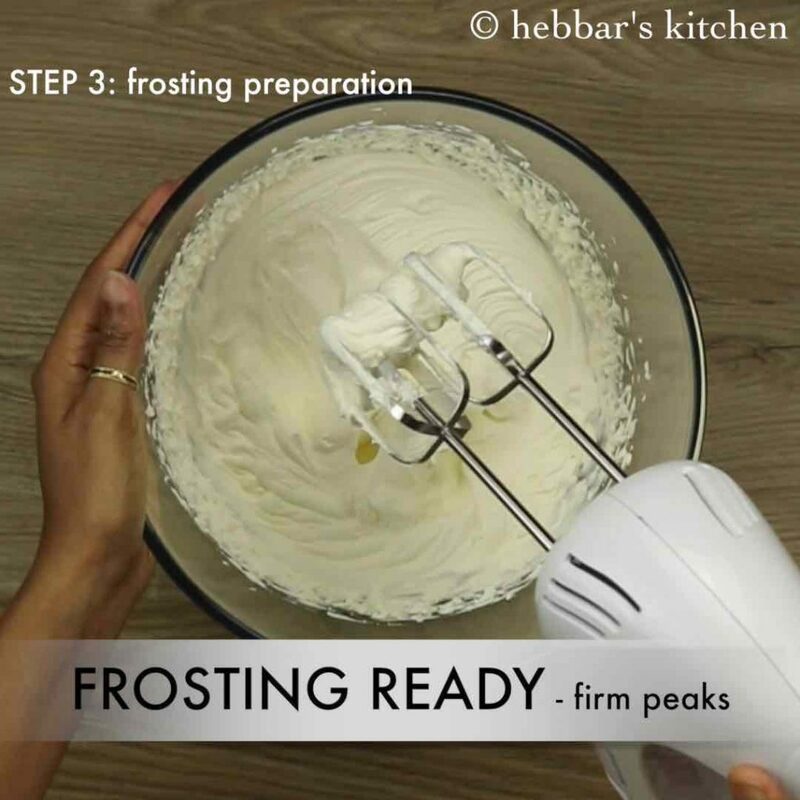 also the thick and firm peaks appear to the frosting. firstly, cut the cake in centre dividing into 2 equal half. i have baked 2 cakes, resulting in 4 layers. now place 1st layer on the turning table. 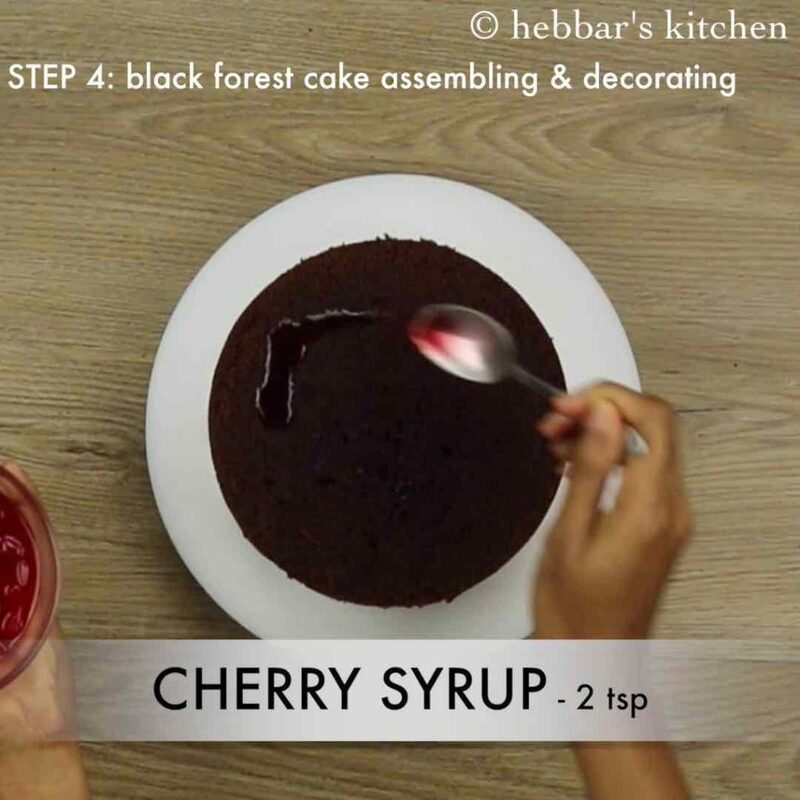 pour in 2 tsp of prepared cherry syrup to make cake more moist. furthermore, spread the generous amount of prepared frosting. 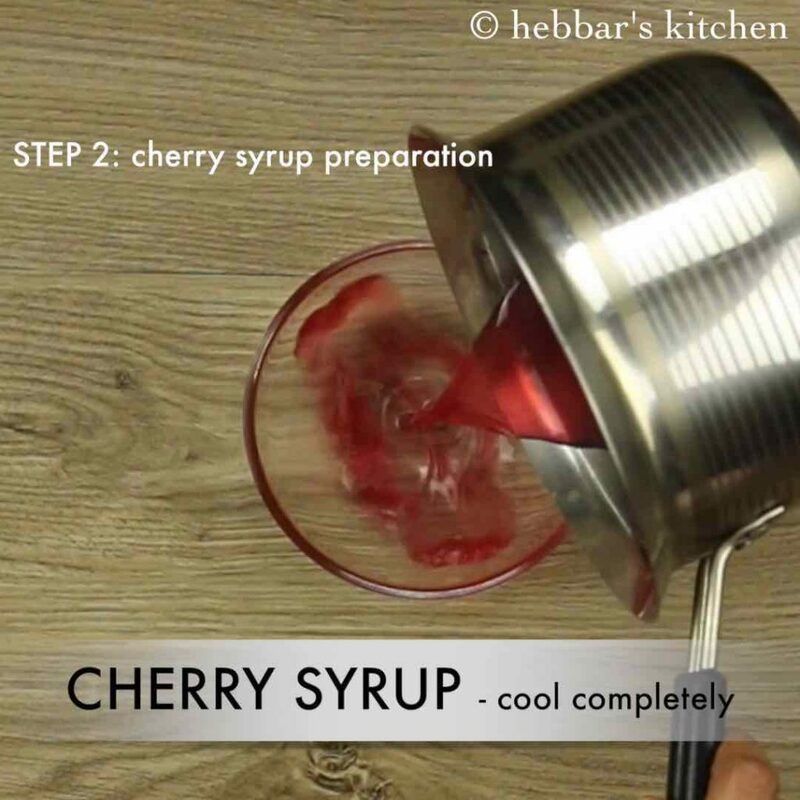 now place another layer of cake and pour more cherry syrup. also spread frosting and place few chopped cherries in the centre. again repeat the same process for 3rd and 4th layer. then with the help of offset spatula or a knife, spread the prepared frosting evenly. spin it around as you frost for an even coating. finally give a final touch making sure there are no crumbs showing through the icing. 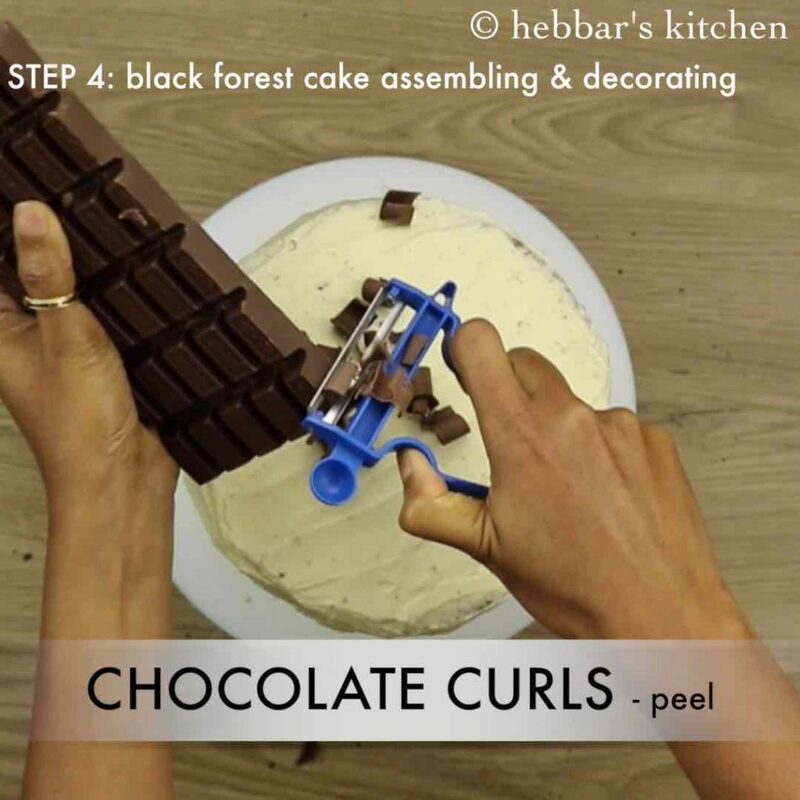 now peel the chocolate to form chocolate curls. place in the centre. 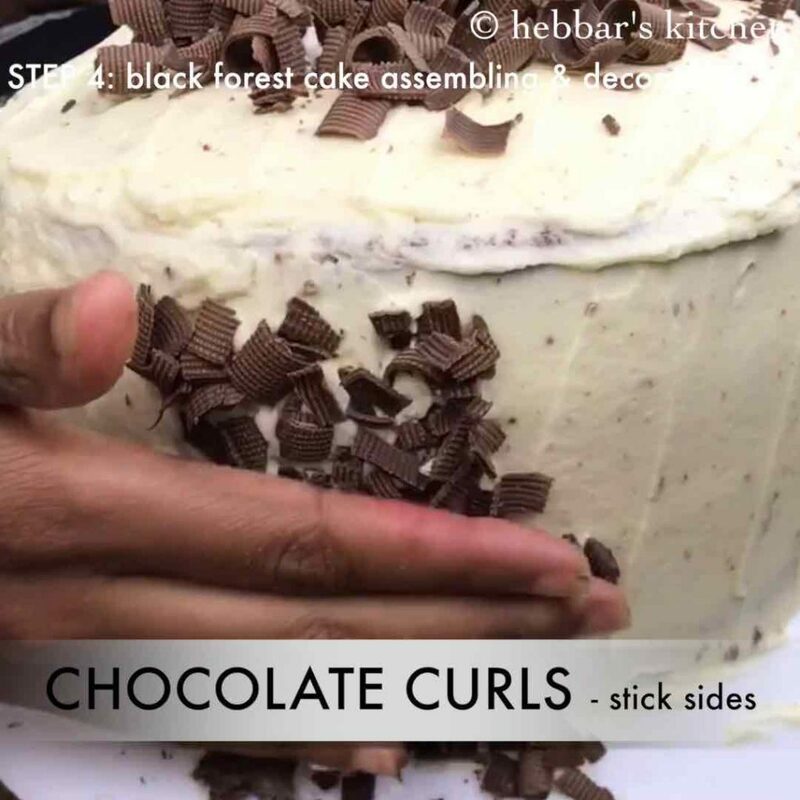 also stick few more chocolate curls on the sides of the cake. 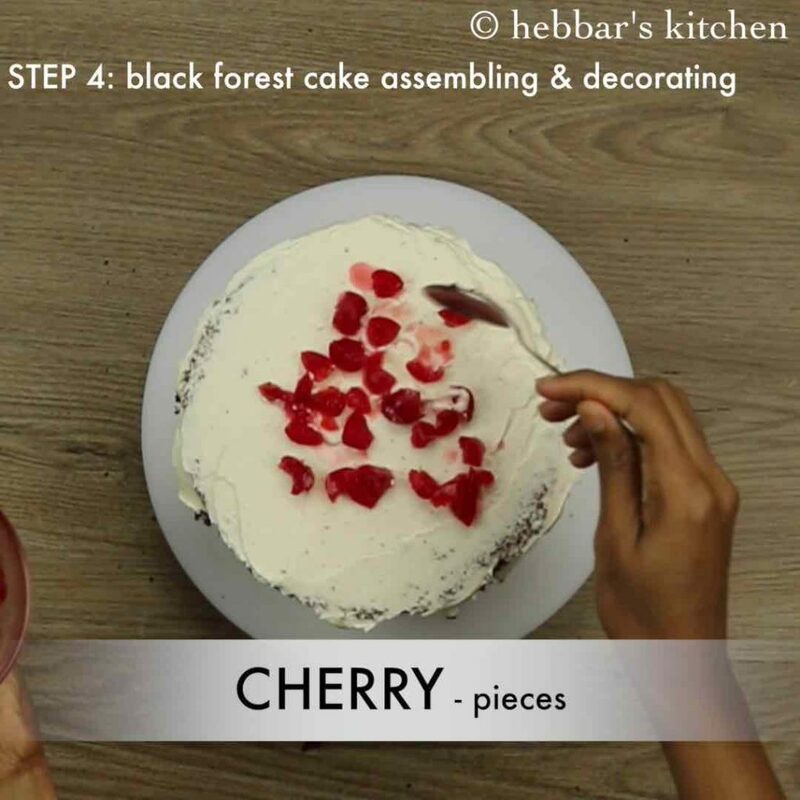 furthermore, with the help of piping bag, decorate cake and place cherries in the centre. 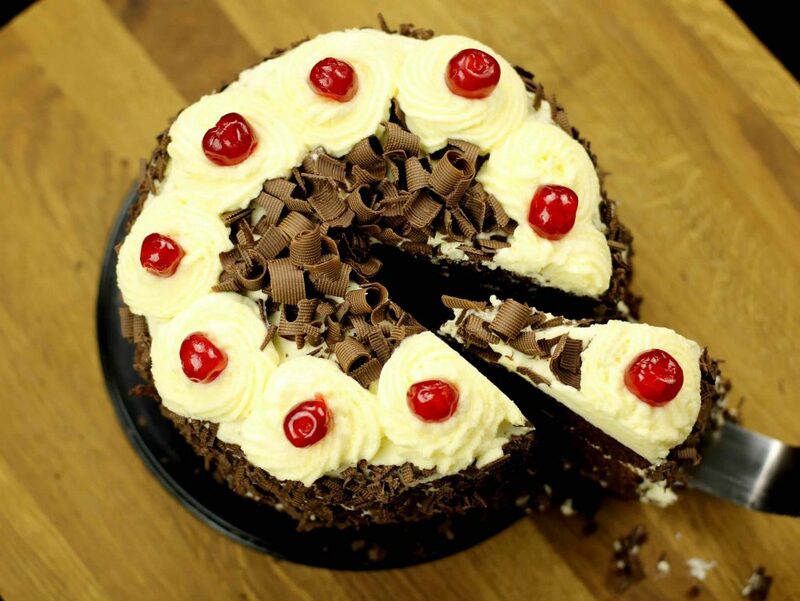 finally, black forest cake is ready to cut and serve. refrigerate and can be consumed for atleast 3-4 days. firstly, frost the cake only after its cooled completely, else the frosting will melt. furthermore, use oil instead of butter if you are preserving the cake and eating later. 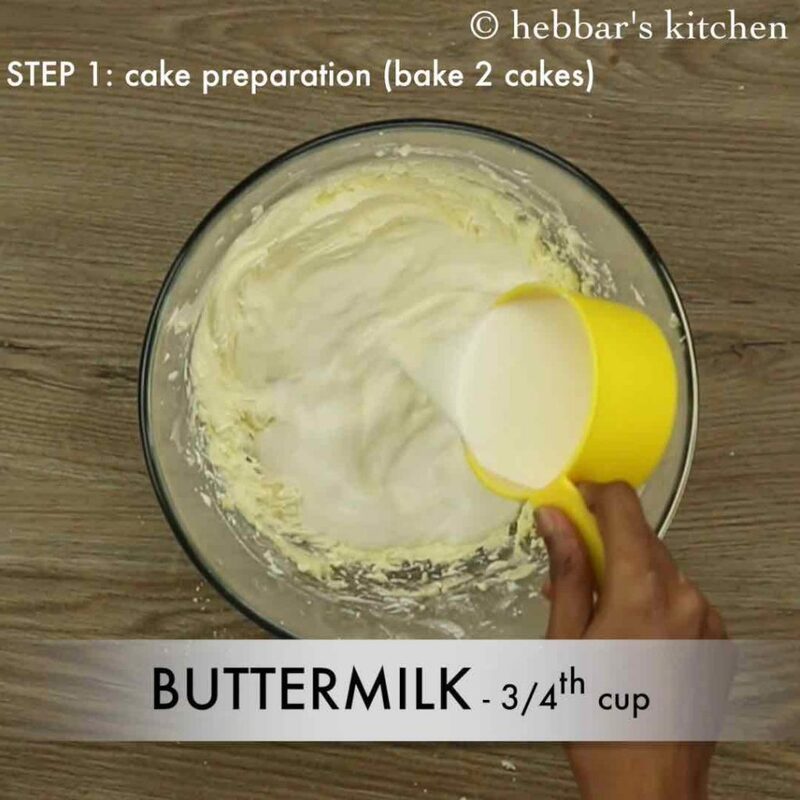 as butter hardens once refrigerated whereas oil doesn’t and keeps cake more moist. also to bake in microwave convection mode pre heat and bake at 180 degrees for 30 minutes. and to bake in cooker check out how to bake in cooker. 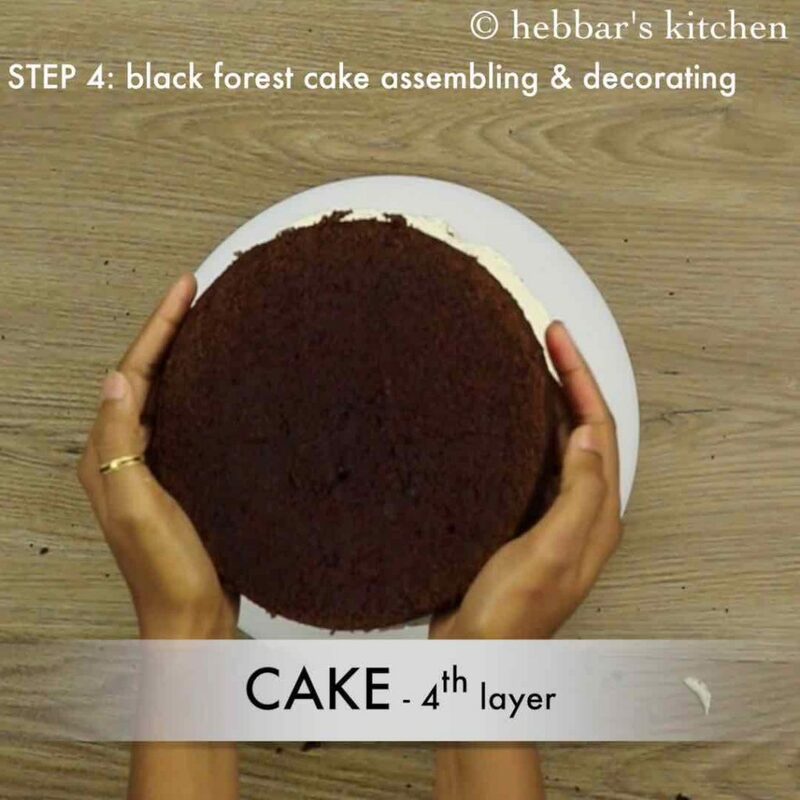 additionally, black forest cake can be done with just 2 layers. Thanks archana for making our culinary sooo easy. Cake turned out very fluffy and tasty. Once again thanks for the wonderful recipe. 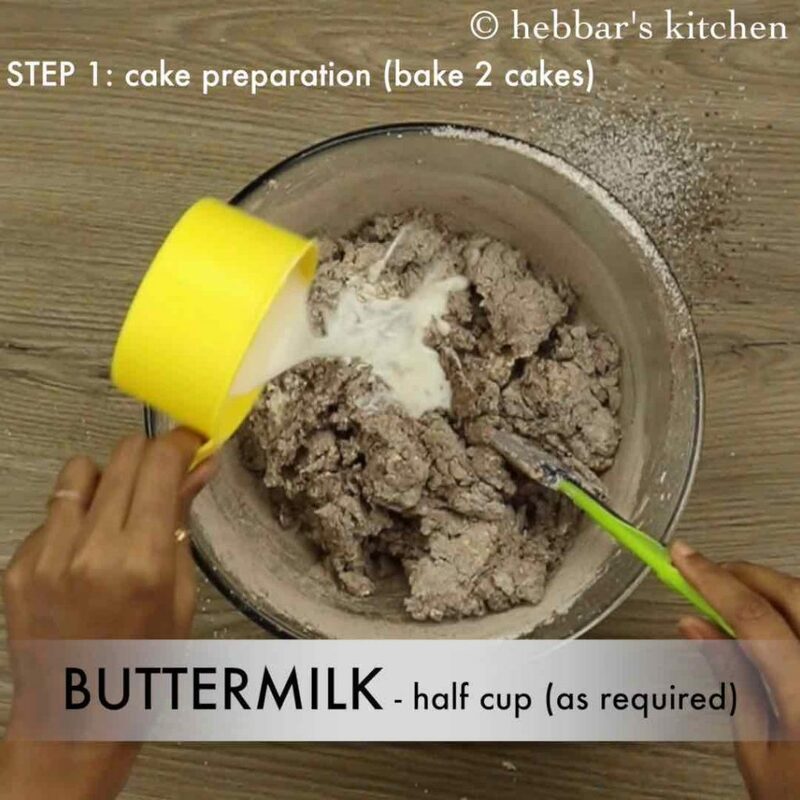 thank you very much.. please share the image on facebook tagging Hebbar’s Kitchen..
Hi, first of all I love all your recipes. I never made a cake and thinking to make this cake for our anniversary. But I just want to know where can I find that butter lined paper and piping bags for decoration. Hi, I tried this recipe. it is very tasty. Thanks. Are these red cherries sweetened or fresh cherries? use fresh or canned cherries..
What kind of cherries to use for this one? Fresh ones or the sweetened ones. I love ur all recipes…..
seems like you have not baked in convection mode.. ?? Love all ur recipes and easy tips thanks a lot mam for making cooking so easy !! My qs is we can use the cream which comes out from milk and in that add icing sugar or vanilla extract ? Plz do reply as I wanna prepare this cake tomorrow !! recommend to use store brought cream with 35% milk fat. An awesome recipe! Used oil instead of butter as you had mentioned. Amazing taste and consistency! I tried this for my hubby bday and turned out really very soft n tasty…. I tried this for my hubby bday and turned out really good! I tried this for my hubby bday and turned out super soft and yummy!!!! Where can we get all the ingredients. Is 10 minutes enough for pre heat. yes it should be sufficient. Lovely it is… so easy so tasty. All the receipes here are just too good . 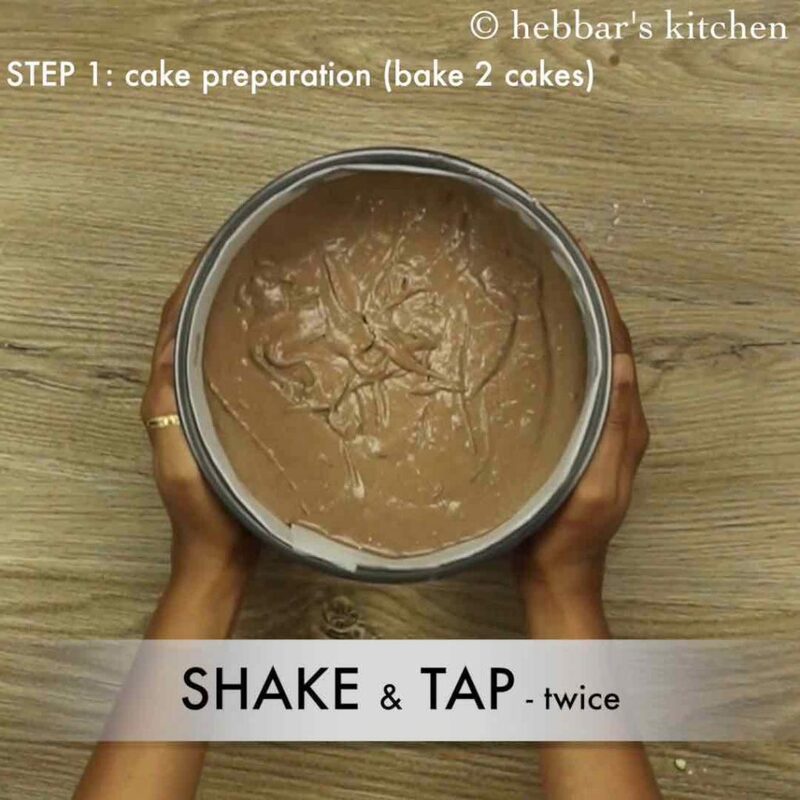 Making cake is so simple after seeing your this recipe. Delicious cake gets ready by this. Thanks alottttttt…. For frosting, can I use the cream that is formed on the milk? Will that be thickened cream? you should be able to do it. thickened cream is easily available in market. anything with 35% or more milk fat content is suitable. what does butter milk mean? Does it mean diluted yougurt? can milkmaid be used instead of cream ? 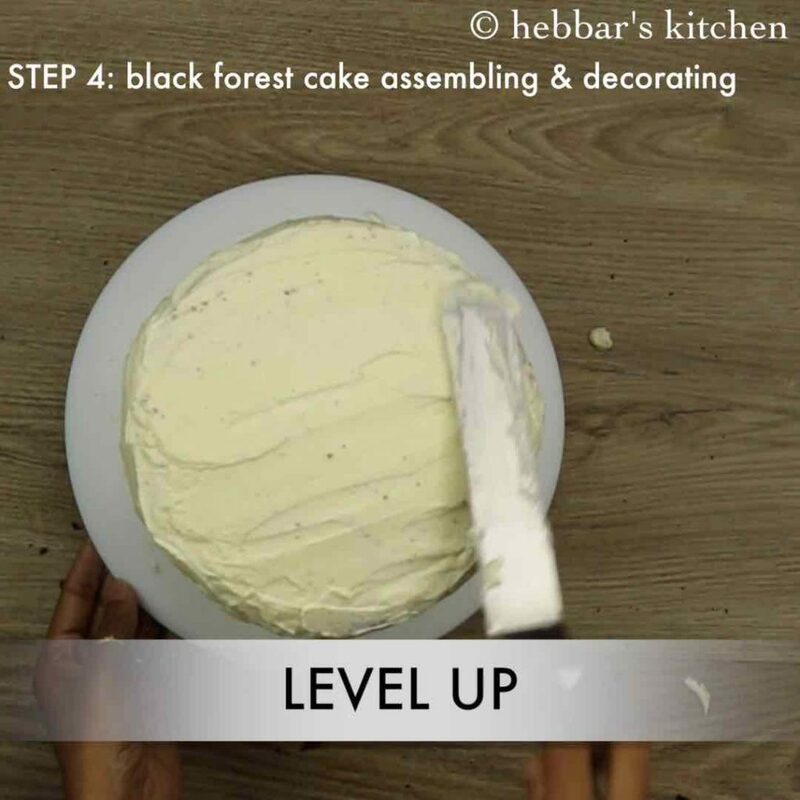 if the recipe calls for cream for frosting preparation, what cream should i use? whipping cream or cooking cream? can bournvita or molten dairy milk be used as substitutes for coco powder or coffee powder? I would heavily recommend finest cocoa powder for this recipe. bournivita or dairy milk would contain other ingredients apart from cocoa powder which may imbalance the cake proportions. 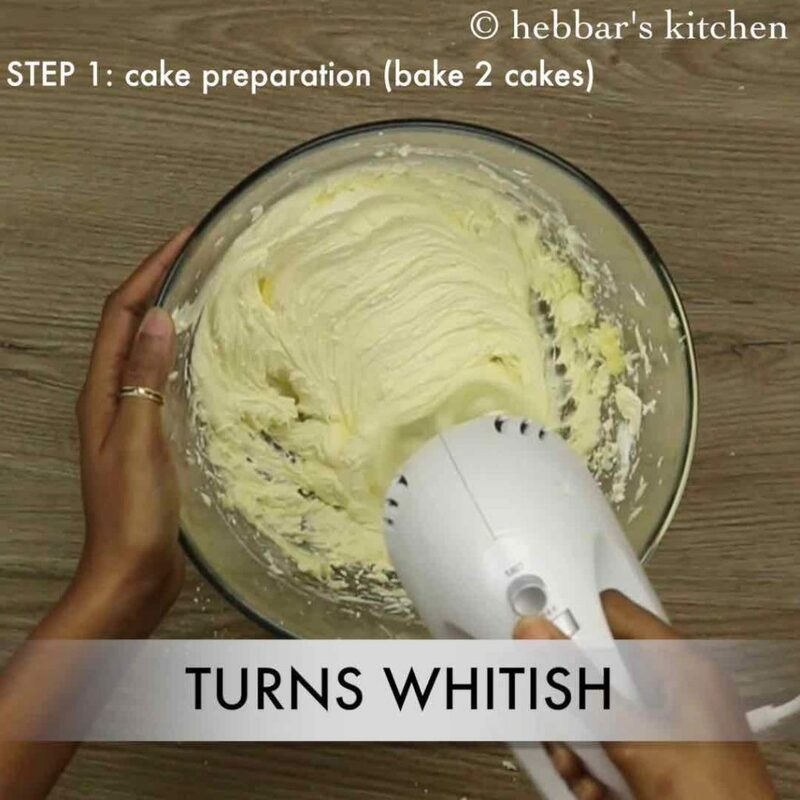 you can whisk it with your hand, but can take some time. Wow!!! Looks awesome and easy to make !!! if using oil, measurement for oil? you are welcome Zubaida. I am glad you liked it. you are welcome pranitha. I am glad you liked it.